For our honour we rather maintain? Of men who have no thought for their own? 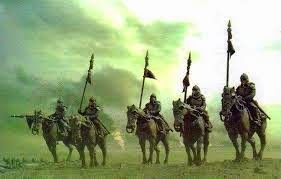 Poet's Notes: "The Dirge of Riders to Sudden Death" continues my obsession with cavalry. In some ways, it is a counter-piece to my "Seven Heartbeats and a Hundred Yards," being about the death of a cavalry squadron, rather than a rout. Though not directly inspired by it, this poem further mirrors the theme of death expressed in Tennyson's famous "The Charge of the Light Brigade," but in contrast to Tennyson, does so without the action of their deaths, but rather through the men singing a song concerning their impending deaths (the titular dirge) that is inherent in their mission, rather than their deaths resulting from a blunder of an order. The theme of courage in the face of certain hopelessness and death is central to the poem. That there is no possibility of victory is reflected via the second and third stanza's emphasis on the ruining of their surroundings, which no doubt has provided the occasion for their dire mission. These men know that they will not be on the victorious side of this conflict. Freed from the concern that all men have for self-preservation and the condition of victory that might otherwise temper their valour, they can now throw themselves entirely into battle and so achieve an unsurpassed level of glory and honour. I frame the poem as if it were heard by the (presumed) poet. This permits the ghostly opening as well as the concluding stanza to put to rest any doubts concerning their fate, creating a mood of heroic sadness. The rhyme scheme follows an AABCCB structure. The alternation of short pairs of consecutive rhyming lines with single longer lines provides an interesting rhythm. I am especially pleased with the aural qualities of this scheme, and shall have to revisit this structure in future poetry. In contrast to the rhyme scheme's regularity, the metre is not strict. The contrast of the shorter rhyming pairs with the longer lines provides a pleasing rhythm, especially as the longer lines' steady count gives the poem structure that a non-metrical rhyme would have lacked. This poem took a rather long time to compose as a consequence of the rhyme and metrical structures. Only the first stanza came easily--the rest took a great deal more thought and time. I find that this is to be expected when I compose more formal poetry. Editor's Note: "The Dirge of Riders to Certain Death" first appeared in the March 2012 issue of Big Pulp and was reprinted in Songs of Eretz Poetry E-zine Volume 1, Issue 7 (July 2014). "Seven Heartbeats and a Hundred Yards" appeared in Songs of Eretz Poetry E-zine Volume 1, Issue 2 (November 2013). The text of Alfred, Lord Tennyson's "The Charge of the Light Brigade" may be found here: http://www.poetryfoundation.org/poem/174586.